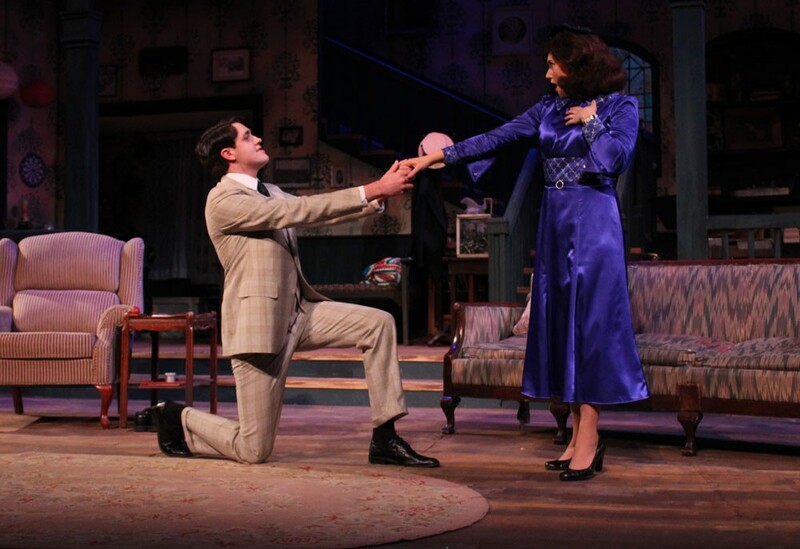 An engagement that leads to mayhem; (left) Dallan Starks as Tony Kirby, and Jessii Arp as Alice Sycamore in You Can't Take It With You. There's no doubting the timeless appeal of You Can't Take It With You, the farcical family comedy that's been produced — somewhere — pretty much constantly since it debuted on Broadway in 1936, winning the Pulitzer for drama the following year. For theater companies large and small, the play penned by George S. Kaufman and Moss Hart offers a chance to produce a show with a large cast of memorable characters, some showy physical comedy and well-earned emotional peaks over the course of its action, all set in the New York City home of Martin "Grandpa" Vanderhof (Kris Kittelson). The production at the Spokane Civic Theatre running through Feb. 17 and directed by David Baker takes full advantage of the slapstick elements infused in the script. There are certainly moments that feel dated, and not just because the play is set in 1936, but those are mostly due to the source material, not the actors or staging. The basic story revolves around one Alice Sycamore (Jessii Arp in her Civic debut), who's fallen in love with her boss' son Tony Kirby (Dallan Starks) and relents in having having Tony and his parents come to dinner at Grandpa's house despite the idiosyncrasies of her extended family. 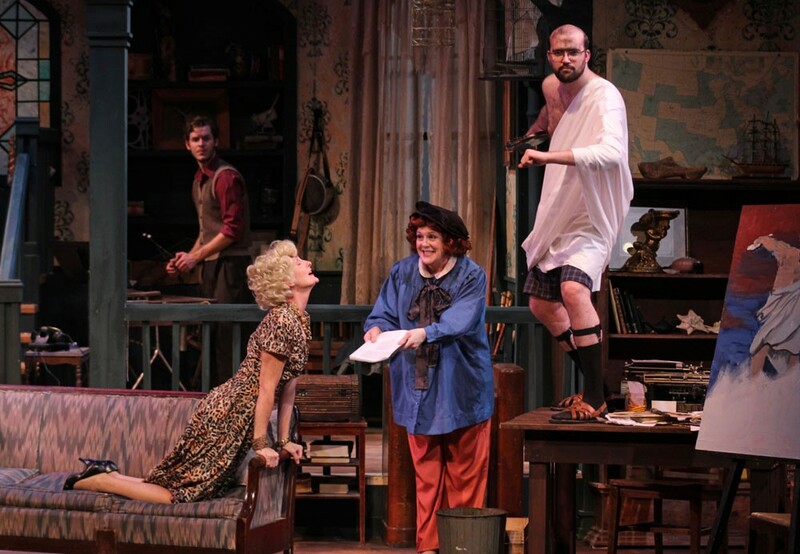 Artists and madness abound in the Spokane Civic's new show, You Can't Take It With You. Alice's mother Penny (Phedre Burney Peters) is an artistic dilettante bouncing between playwriting and painting. Her dad Paul is a fireworks maker, ensconced in the basement with his assistant Mr. DePinna (David Stanley) furiously getting ready for the Fourth of July. Her sister Essie (Sarah Plumb) is a wannabe ballerina married to a xylophonist and printer named Ed (Dennis Burgess III). And that's not to mention the housekeeper, her boyfriend, the IRS and FBI agents, Russian expats and others who whirl around the family in scenes that typically start with just one or two characters on stage and end in chaotic bursts of mayhem. As Tony Kirby's parents come to dinner, the play takes flight as the cultures of Alice's and Tony's families clash through some pre-meal gamesmanship. Doug Dawson as Tony Sr., and Lynn Noel as Miriam Kirby both shine in their time on stage, going from aristocratic guests to a sniping married couple to, eventually, utterly crazed as they're hauled into jail along with the rest of the household after the feds discover all the gunpowder in the basement. There are moments over the course of You Can't Take It With You that the chaos on stage threatens the audience's ability to keep up. Some lines of dialogue disappeared into the ether due to just the sheer amount of action happening, and some because the actors were simply too soft spoken to break through. Conversely, some of the actors really shined through the mayhem, particularly Burney-Peters, Dane Larson as ballet teacher Borish Kolenkhov and Deborah Brooks as Gay Wellington, an actress brought home by Penny to read Penny's plays, only to get drunk and fall asleep on various flat surfaces in the house, oblivious to the chaos around her. Jokes about the Russian revolution will probably leave younger audience members scratching their heads rather than laughing out loud, but there's plenty of humor that stands the test of time in You Can't Take It With You. And it's ultimate message of prioritizing the important things in life — true love, family, passion for one's work — assure that this show will keep being produced for years to come.